"They wanted to kidnap me unnoticed, but they failed." 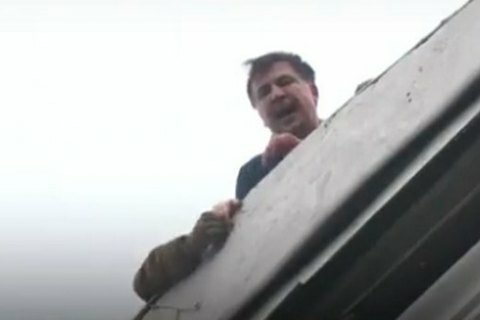 Leader of the New Forces Movement party, ex-head of Odesa regional state administration, Mikheil Saakashvili, climbed the roof of the residential building on 7 Kostyolna St. in Kyiv's center, lb.ua reported from the scene on Tuesday morning. He shouted down to journalists and political supporters who gathered outside the house that law enforcement officers came to search his apartment and asked for support. "They want to kidnap me, because I rallied Ukrainian people's defense," the politician told the gathering. "They wanted to kidnap me unnoticed, but they failed." Saakashvily was soon taken from the roof of the house by law enforcers and detained. Late last week, Saakashvili said that he was going to be arrested allegedly on order of the president. It was rumoured that Saakashvili was planned to be deported to the Netherlands.